The only independent non-foreign owned supplier of road paving materials in Oneida, Madison and Herkimer counties. The Ocuto Blacktop & Paving story started out from Jim and Carol Ocuto's home in Mohawk, NY in 1967. Deciding to pursue the blacktop paving business, the 22 year-old Jim Ocuto purchased a small dump truck, a blacktop spreader box and an old $250 power roller that needed work. Then, along with his two employees, he began paving residential driveways and small commercial parking lots. Carol Ocuto handled the book keeping and office work. Five years later, in 1972, after expanding their business capabilities (upgrading their equipment and workforce), the Ocuto's incorporated their paving venture as Ocuto Blacktop & Paving Co. Inc. In 1977 Mr. Ocuto acted on his good business foresight and purchased their present property on lower Lawrence Street in Rome. During that same year of 1977, the Ocuto's formed another business venture, Alliance Paving Materials Inc., which would produce and market asphalt concrete (blacktop) for Rome and surrounding areas. The newly formed Alliance firm moved right ahead and erected a new bituminous drum mixer and began manufacturing blacktop. However, two years later, in 1979, they erected their 2 ton asphalt concrete batch plant to meet growing business demands. The batch plant is a NYSDOT approved plant. 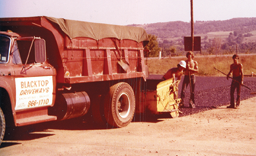 In 1980, Alliance Paving Materials, Inc. purchased a sand and gravel bed in Western, NY, a few miles north of Rome.